Just when I thought former Alaska Governor and Vice Presidential candidate Sarah Palin could no longer cause me to drop my jaw in disbelief, again she astounds me with her most unbelievable gaff yet. In the aftermath of opposition from numerous critics, Palin rebutted with more than a trace of ire, explaining she often uses the phrase when chastising her daughter for avoiding homework. “Just to be careful, from now on I’ll avoid using it with Piper, and I would appreciate it if the media refrained from using words and phrases like igloo, Eskimo Pie, and ‘when hell freezes over,’ as they might be considered offensive by my extended Alaska Native family,” she stated. Explaining that she would choose to chastise President Obama in the same way she gets after an immature school child adds insult to injury. Her choice of words in this latest verbal debacle exposes a transparent ethnocentrism based in dislike and fear of those who don’t fit into her group of white, American-born patriots. Her phraseology harkens back to a time in our country when African American’s were enslaved, treated as having no more intelligence than a young child and denied a voice in their own governance. It is on par with the empty chair on the GOP convention stage, lauded as brilliant by so many of her party’s rank and file. As a standard bearer for conservative American’s, Palin should endeavor to elevate the larger political dialogue above the use of such demeaning language. It is a stretch to believe that she intended no slur by her use of words that most well socialized persons understand to be a dated ethnic stereotype. That would be akin to believing she might teach Trig the well known counting rhyme, eeny, meeny, miny, moe, without changing the offensive and inflammatory subject in the follow-up sentence from a bygone era, to the current “tiger”. An illustration Palin herself might more readily understand (and I make this assumption because there are two Downs children in my own extended family) would be to call a physically or mentally challenged person a “retard” in this day and age. Everybody knows better. If Sarah Palin wishes to place herself in a position of leadership on the political front, she does not have the luxury of being a lazy linguist. It would serve her well to take the time and make the effort to expand her cultural and social education, and smooth the sharp edges of her plain-folk talk. The point is, by virtue of Palin’s lack of worldly sophistication I could call her a hick, a redneck, or socially retarded (to use the word in its true meaning of delayed development), but that would just show ignorance on my part. 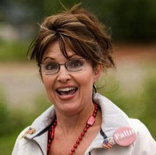 And that said, Congratulations Sarah Palin, you win the MAD Goddess Faux Paux Hairball.